Singapore’s most popular noodle dish, is very simple to make. The most important thing about this recipe is to have all your ingredients very near the stove. Group them in 3-4 bowls and throw them in your wok or pan in the correct order. And there you have it! Lunch or dinner so much better than take-away. Put the noodles in a glass bowl and pour over boiling water. Let them soak for one minute. Drain well and rinse with plenty of cold water to stop the cooking. Put in a bowl and sprinkle with half the curry powder. Mix and leave near the stove until needed. In a small bowl, mix the soy sauce, sherry and sugar. In a third bowl mix the garlic, ginger, chillies and the remaining curry powder. Finally, put in a larger bowl, the corn, peas, beans and spring onions. Place all bowls near the stove, with the rest of the ingredients. Heat the oil in a wok over high heat. Throw in the garlic, ginger and chillies. Stir fry until fragrant, about 1 minute. Add the chicken and fry stirring 2-3 minutes until cooked. Add the vegetables and prawns. Stir fry for a minute, add the noodles and drizzle the soy, sherry and sugar. Mix everything together, using two forks, taking care not to break the noodles (to be honest, usually, I’m not that careful). 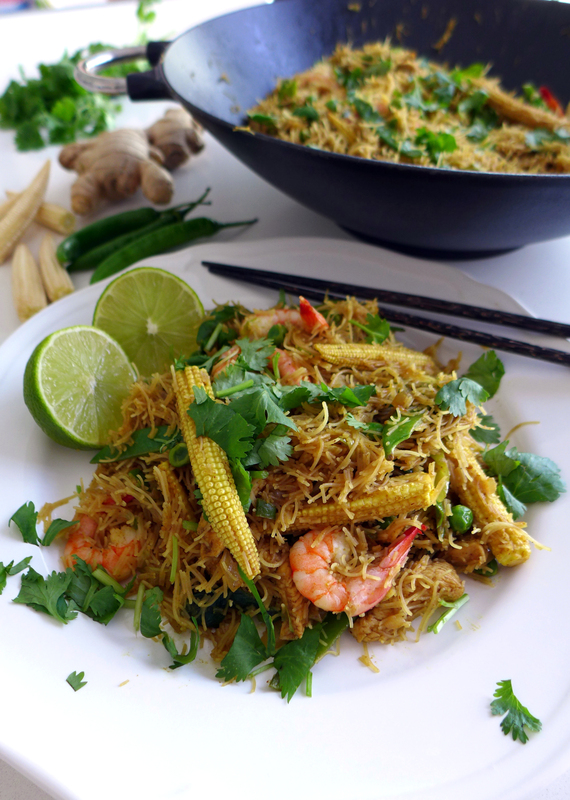 Serve with the lime, sprinkled with fresh coriander leaves.